Sunshine Kelly | Beauty . Fashion . Lifestyle . Travel . Fitness: Green Wellness: How Safe is Your Family in Your Own Hands? Green Wellness: How Safe is Your Family in Your Own Hands? Green Wellness: How Safe Are Your Family in Your Own Hands? Hey let’s start the week with lots of positivity. As you know health is wealth, there is no two ways about it. Usually I am the one who did all the household groceries, daily essentials purchases and run the family errands. Therefore I always put health and wellness above everything when I make my decision during my purchases. I know some of you are in the same situation like me, so have you ever wonder How Safe is Your Family in Your Own Hands? What do you usually consider before you make your purchase? As for me, I am very particular when it comes to groceries and food. Remember we are what we eat, I don’t mind paying a little bit more but the quality and safety of the products are assured. I know that organic food maybe a bit pricey from the normal ones, well for the benefits of my family health including myself I don’t mind. Food safety is one of the issues we have to take note. Some companies are not honest with their claims because all the want is maximum profit without considering the health of their consumer. Recently, I was introduced to Green Wellness at www.greenwellness.my an online shop that focuses on healthy groceries and preventive healthcare. 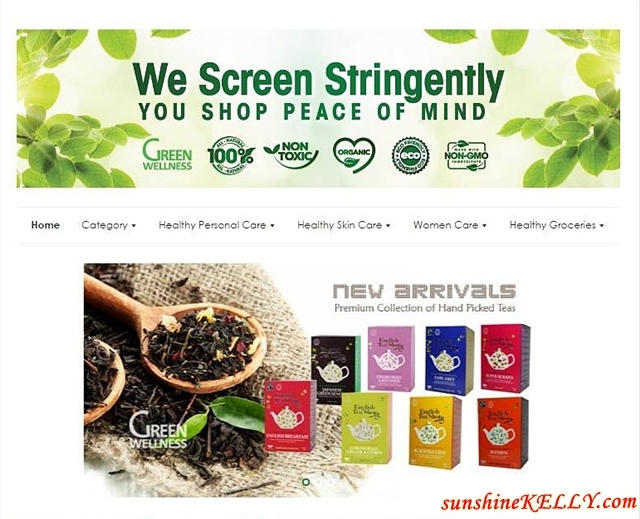 Every product is screened stringently, only selected premium products free from toxic chemical such as artificial preservatives, coloring and flavoring are sold in their online store. As working urbanites sometime we don’t have the luxury of time to go to supermarket for groceries plus the hassle of looking for car park and not to mention the traffic jam in the city. Green Wellness is my solution, I can find a wide arrays of organic and healthy groceries, nutritional supplements and remedies, nutritional diet, healthy personal care and etc on my fingertips at at anytime and anywhere. The order will be delivered to our door step. As you can see I bought quite a lot of organic groceries from Green Wellness such as the organic quick oats and pitted prunes are great source of energy, fiber and vitamins for breakfast, snacks and anytime. Here are my superfood organic chia seed, turmeric and ginger powder. Plus the Apple cider vinegar, extra virgin olive oil, coconut cooking oil, natural gojiberry, organic soupmix and etc. There is no risk, the transaction is easy and safe. For your first online purchase, if you are not completely happy for any reason, you can return the products to them within 30 days of purchase. In addition to refunding 100% of your purchase price, Green Wellness will refund your shipping and handling, and they will even pay for the return shipping back to them.